Designers Claire Eglizeaud & Paul Moreau wrote from France to introduce their cool new shop, Bonjour Mon Coussin. They've created a line of graphic pillows (and it looks like they have a penchant for orange.) Have a little fun browsing right here. And then if you need some more orange to kick off your week, watch this nutty advertisement for a Dutch supermarket giving away soccer mascots (right?). I can't understand a word, but it made me smile. gosh dang, those pillows are soooo adorable. I love orange, too, so moving here has been bliss! Orange everywhere! Is that the Jonathan Adler shower curtain fabric (graphic letter pillow) or are my eyes failing me? I'm Dutch, and yes, they're orange mascots to support the Dutch football team, free with every 15 euros spent at Albert Heijn. I'm loving the pillow on the bottom left. I love your blog! I am a purple freak, so I understand your obsession with orange. I didn't know so many cute orange things even existed! i...must...have...these. the bright colors are so stunning! What fantastic cushions, so original! 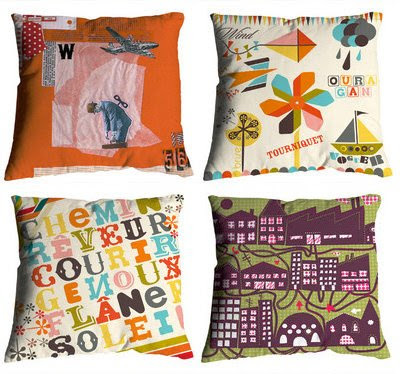 These are great.... really unexpected fabric choices for pillows, i love it! OMG, totally cute pillows!!! I love orange, I use it as an accent color in almost all of my rooms. And I love looking at all the super cute orange things on your blog!